Opioid use for long-term pain management is limited by adverse side effects, such as hyperalgesia and negative affect. Neuroinflammation in the brain and spinal cord is a contributing factor to the development of symptoms associated with chronic opioid use. Recent studies have described a link between neuroinflammation and behavior that is mediated by a gut–brain signaling axis, where alterations in indigenous gut bacteria contribute to several inflammation-related psychopathologies. As opioid receptors are highly expressed within the digestive tract and opioids influence gut motility, we hypothesized that systemic opioid treatment will impact the composition of the gut microbiota. Here, we explored how opioid treatments, and cessation, impacts the mouse gut microbiome and whether opioid-induced changes in the gut microbiota influences inflammation-driven hyperalgesia and impaired reward behavior. 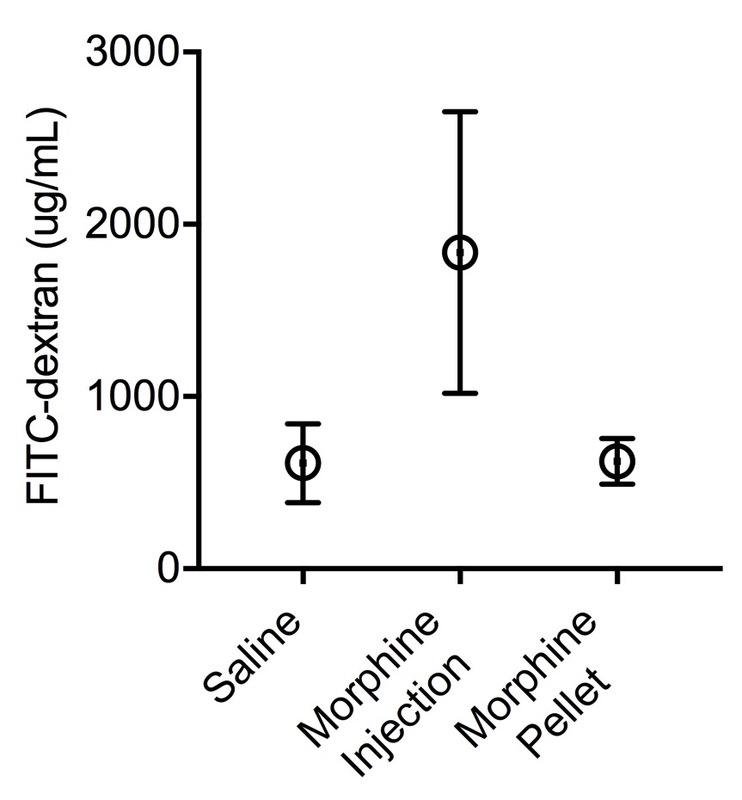 Male C57Bl6/J mice were treated with either intermittent or sustained morphine. Using 16S rDNA sequencing, we describe changes in gut microbiota composition following different morphine regimens. Manipulation of the gut microbiome was used to assess the causal relationship between the gut microbiome and opioid-dependent behaviors. Intermittent, but not sustained, morphine treatment was associated with microglial activation, hyperalgesia, and impaired reward response. Depletion of the gut microbiota via antibiotic treatment surprisingly recapitulated neuroinflammation and sequelae, including reduced opioid analgesic potency and impaired cocaine reward following intermittent morphine treatment. Colonization of antibiotic-treated mice with a control microbiota restored microglial activation state and behaviors. Our findings suggest that differing opioid regimens uniquely influence the gut microbiome that is causally related to behaviors associated with opioid dependence. Cahill C, Taylor A. Neuroinflammation—a co-occurring phenomenon linking chronic pain and opioid dependence. Curr Opin Behav Sci. 2017;13:171–7. Cahill CM, Walwyn W, Taylor AM, Pradhan AA, Evans CJ. Allostatic mechanisms of opioid tolerance beyond desensitization and downregulation. Trends Pharmacological Sci. 2016;37:963–76. Raghavendra V, Rutkowski MD, DeLeo JA. The role of spinal neuroimmune activation in morphine tolerance/hyperalgesia in neuropathic and sham-operated rats. J Neurosci. 2002;22:9980–9. Raghavendra V, Tanga FY, DeLeo JA. Attenuation of morphine tolerance, withdrawal-induced hyperalgesia, and associated spinal inflammatory immune responses by propentofylline in rats. Neuropsychopharmacology. official publication of the American College of Neuropsychopharmacology 2004;29:327–34. Ferrini F, Trang T, Mattioli TA, Laffray S, Del’Guidice T, Lorenzo LE, et al. Morphine hyperalgesia gated through microglia-mediated disruption of neuronal Cl(−) homeostasis. Nat Neurosci. 2013;16:183–92. Burma NE, Bonin RP, Leduc-Pessah H, Baimel C, Cairncross ZF, Mousseau M, et al. Blocking microglial pannexin-1 channels alleviates morphine withdrawal in rodents. Nat Med. 2017;23:355–60. Hutchinson MR, Lewis SS, Coats BD, Skyba DA, Crysdale NY, Berkelhammer DL, et al. Reduction of opioid withdrawal and potentiation of acute opioid analgesia by systemic AV411 (ibudilast). Brain Behav Immun. 2009;23:240–50. Song P, Zhao Z-Q. The involvement of glial cells in the development of morphine tolerance. Neurosci Res. 2001;39:281–6. Taylor AM, Castonguay A, Ghogha A, Vayssiere P, Pradhan AA, Xue L, et al. Neuroimmune regulation of GABAergic neurons within the ventral tegmental area during withdrawal from chronic morphine. Neuropsychopharmacology. official publication of the American College of Neuropsychopharmacology 2016;41:949–59. Romer Thomsen K, Whybrow PC, Kringelbach ML. Reconceptualizing anhedonia: novel perspectives on balancing the pleasure networks in the human brain. Front Behav Neurosci. 2015;9:49. Tye KM, Mirzabekov JJ, Warden MR, Ferenczi EA, Tsai HC, Finkelstein J, et al. Dopamine neurons modulate neural encoding and expression of depression-related behaviour. Nature. 2013;493:537–41. Felger JC, Treadway MT. Inflammation effects on motivation and motor activity: role of dopamine. Neuropsychopharmacology: official publication of the American College of Neuropsychopharmacology. 2017;42:216–41. Erny D, Hrabe de Angelis AL, Jaitin D, Wieghofer P, Staszewski O, David E, et al. Host microbiota constantly control maturation and function of microglia in the CNS. Nat Neurosci. 2015;18:965–77. Sampson TR, Debelius JW, Thron T, Janssen S, Shastri GG, Ilhan ZE, et al. Gut Microbiota Regulate Motor Deficits and Neuroinflammation in a Model of Parkinson’s Disease. Cell. 2016;167:1469–80.e1412. Cowan CSM, Hoban AE, Ventura-Silva AP, Dinan TG, Clarke G, Cryan JF. Gutsy moves: the amygdala as a critical node in microbiota to brain signaling. Bioessays. 2018;40:1700172. Zheng P, Zeng B, Zhou C, Liu M, Fang Z, Xu X, et al. Gut microbiome remodeling induces depressive-like behaviors through a pathway mediated by the host’s metabolism. Mol Psychiatry. 2016;21:786–96. De Schepper HU, Cremonini F, Park MI, Camilleri M. Opioids and the gut: pharmacology and current clinical experience. Neurogastroenterol Motil. 2004;16:383–94. Koob GF, Maldonado R, Stinus L. Neural substrates of opiate withdrawal. Trends Neurosci. 1992;15:186–91. Rhee SH, Pothoulakis C, Mayer EA. Principles and clinical implications of the brain-gut-enteric microbiota axis. Nat Rev Gastroenterol Hepatol. 2009;6:306–14. Acharya C, Betrapally NS, Gillevet PM, Sterling RK, Akbarali H, White MB, et al. Chronic opioid use is associated with altered gut microbiota and predicts readmissions in patients with cirrhosis. Aliment Pharmacol Ther. 2017;45:319–31. Banerjee S, Sindberg G, Wang F, Meng J, Sharma U, Zhang L, et al. Opioid-induced gut microbial disruption and bile dysregulation leads to gut barrier compromise and sustained systemic inflammation. Mucosal Immunol. 2016;9:1418–28. Wang F, Meng J, Zhang L, Johnson T, Chen C, Roy S. Morphine induces changes in the gut microbiome and metabolome in a morphine dependence model. Sci Rep. 2018;8:3596. Reikvam DH, Erofeev A, Sandvik A, Grcic V, Jahnsen FL, Gaustad P, et al. Depletion of murine intestinal microbiota: effects on gut mucosa and epithelial gene expression. PLoS ONE. 2011;6:e17996. Caporaso JG, Lauber CL, Walters WA, Berg-Lyons D, Lozupone CA, Turnbaugh PJ, et al. Global patterns of 16S rRNA diversity at a depth of millions of sequences per sample. Proc Natl Acad Sci USA. 2011;108:4516–22. Karperien A, Ahammer H, Jelinek HF. Quantitating the subtleties of microglial morphology with fractal analysis. Front Cell Neurosci. 2013;7:3. Evans CJ, Cahill CM. Neurobiology fo opioid dependence in creating addiction vulnerability. F1000 Res. 2016;5:1–11. Leri F, Zhou Y, Goddard B, Cummins E, Kreek MJ. Effects of high-dose methadone maintenance on cocaine place conditioning, cocaine self-administration, and mu-opioid receptor mRNA expression in the rat brain. Neuropsychopharmacology. official publication of the American College of Neuropsychopharmacology 2006;31:1462–74. Harned M, Sloan P. Safety concerns with long-term opioid use. Expert Opin Drug Saf. 2016;15:955–62. Hutchinson MR, Northcutt AL, Hiranita T, Wang X, Lewis SS, Thomas J, et al. Opioid activation of toll-like receptor 4 contributes to drug reinforcement. J Neurosci. 2012;32:11187–200. Hutchinson MR, Zhang Y, Shridhar M, Evans JH, Buchanan MM, Zhao TX, et al. Evidence that opioids may have toll-like receptor 4 and MD-2 effects. Brain Behav Immun. 2010;24:83–95. Mayer EA, Tillisch K, Gupta A. Gut/brain axis and the microbiota. J Clin Invest. 2015;125:926–38. Tynan RJ, Naicker S, Hinwood M, Nalivaiko E, Buller KM, Pow DV, et al. Chronic stress alters the density and morphology of microglia in a subset of stress-responsive brain regions. Brain Behav Immun. 2010;24:1058–68. Martinez-Laorden E, Hurle MA, Milanes MV, Laorden ML, Almela P. Morphine withdrawal activates hypothalamic-pituitary-adrenal axis and heat shock protein 27 in the left ventricle: the role of extracellular signal-regulated kinase. J Pharmacol Exp Ther. 2012;342:665–75. Sudo N, Chida Y, Aiba Y, Sonoda J, Oyama N, Yu XN, et al. Postnatal microbial colonization programs the hypothalamic-pituitary-adrenal system for stress response in mice. J Physiol. 2004;558:263–75. Buffington SA, Di Prisco GV, Auchtung TA, Ajami NJ, Petrosino JF, Costa-Mattioli M. Microbial reconstitution reverses maternal diet-induced social and synaptic deficits in offspring. Cell. 2016;165:1762–75. Zhou Y, Leri F, Ho A, Kreek MJ. Suppression of hypothalamic-pituitary-adrenal axis by acute heroin challenge in rats during acute and chronic withdrawal from chronic heroin administration. Neurochem Res. 2013;38:1850–60. Foster JA, Rinaman L, Cryan JF. Stress & the gut–brain axis: regulation by the microbiome. Neurobiol Stress. 2017;7:124–36. Goehler LE, Park SM, Opitz N, Lyte M, Gaykema RP. Campylobacter jejuni infection increases anxiety-like behavior in the holeboard: possible anatomical substrates for viscerosensory modulation of exploratory behavior. Brain Behav Immun. 2008;22:354–66. Lyte M, Li W, Opitz N, Gaykema RP, Goehler LE. Induction of anxiety-like behavior in mice during the initial stages of infection with the agent of murine colonic hyperplasia Citrobacter rodentium. Physiol Behav. 2006;89:350–7. Kelly JR, Kennedy PJ, Cryan JF, Dinan TG, Clarke G, Hyland NP. Breaking down the barriers: the gut microbiome, intestinal permeability and stress-related psychiatric disorders. Front Cell Neurosci. 2015;9:392. Yarandi SS, Peterson DA, Treisman GJ, Moran TH, Pasricha PJ. Modulatory effects of gut microbiota on the central nervous system: how gut could play a role in neuropsychiatric health and diseases. J Neurogastroenterol Motil. 2016;22:201–12. Meng J, Yu H, Ma J, Wang J, Banerjee S, Charboneau R, et al. Morphine induces bacterial translocation in mice by compromising intestinal barrier function in a TLR-dependent manner. PLoS ONE. 2013;8:e54040. Bhave S, Gade A, Kang M, Hauser KF, Dewey WL, Akbarali HI. Connexin-purinergic signaling in enteric glia mediates the prolonged effect of morphine on constipation. FASEB J. 2017;31:2649–60. Matzke GR, Zhanel GG, Guay DR. Clinical pharmacokinetics of vancomycin. Clin Pharmacokinet. 1986;11:257–82. Frohlich EE, Farzi A, Mayerhofer R, Reichmann F, Jacan A, Wagner B, et al. Cognitive impairment by antibiotic-induced gut dysbiosis: analysis of gut microbiota-brain communication. Brain Behav Immun. 2016;56:140–55. Kang M, Mischel RA, Bhave S, Komla E, Cho A, Huang C, et al. The effect of gut microbiome on tolerance to morphine mediated antinociception in mice. Sci Rep. 2017;7:42658. Kiraly DD, Walker DM, Calipari ES, Labonte B, Issler O, Pena CJ, et al. Alterations of the host microbiome affect behavioral responses to cocaine. Sci Rep. 2016;6:35455. Bercik P, Denou E, Collins J, Jackson W, Lu J, Jury J, et al. The intestinal microbiota affect central levels of brain-derived neurotropic factor and behavior in mice. Gastroenterology. 2011;141:599–609. Nee J, Zakari M, Sugarman MA, Whelan J, Hirsch W, Sultan S, et al. Efficacy of treatments for opioid-induced constipation: a systematic review and meta-analysis. Clin Gastroenterol Hepatol. 2018;S1542-3565:30087–9. Corder G, Tawfik VL, Wang D, Sypek EI, Low SA, Dickinson JR, et al. Loss of mu opioid receptor signaling in nociceptors, but not microglia, abrogates morphine tolerance without disrupting analgesia. Nat Med. 2017;23:164–73. We would like to thank the NIDA Drug Supply for the cocaine and morphine sulfate powder, as well as the morphine and control subcutaneous pellets. This work was supported the National Institutes for Health (DA40016 to AMWT and DA005010 to CJE), The American Pain Society (Future Leaders in Pain Research to AMWT), the Shirley and Stefan Hatos Foundation (KL, CJE, AMWT), the Alfred P. Sloan Foundation Fellowship in Neuroscience (EYH), and UPLIFT: UCLA Postdoctoral Longitudinal Investment in Faculty Award (K12GM106996 to HEV). Correspondence to Anna M. W. Taylor.